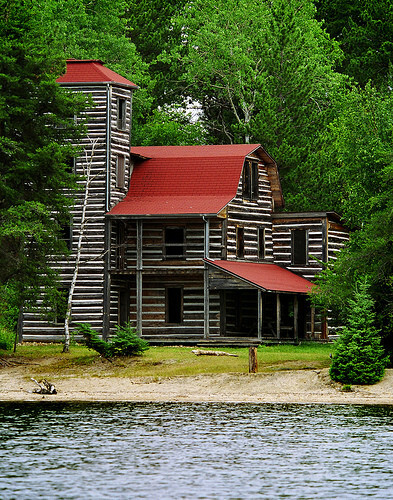 This elaborate three-storey log home was built in the early 1900’s. James A. McOuat, a lone trapper but one with many friends in Ignace, built his home out of large red pine logs some weighing 1600 pounds. “I put it up without any help whatever," Jimmy said back in 1914. He used a block and tackle method to raise these logs to their place. He was told back when he lived in the Ottawa Valley “ye’ll never do no good, ye’ll die in a shack”. Taking these sayings to heart he decided to build himself a castle. The Castle was finished in 1914 with the four storey tower and hip roof covered in tar paper. Unfortunately Jimmy died in the fall of 1918 and his body was discovered the following spring by forest rangers. His grave remains at the castle to this day. The decaying castle was renovated by “Friends of White Otter Castle” and is still maintained today. It can be accessed by float plane or canoe in the summer and by snowmobile in the winter. It is approximately a 40 km trip by canoe and portage starting right in the town of Ignace. When starting a trip from Agimak Lake in Ignace there are 15 portages to White Otter Lake. Maps of the canoe route can be picked up for free at the Tourist Information Centre and Township of Ignace Office, 34 Highway 17 West, Ignace, Ontario.